I saw this vertical garden in an email from House and Home and thought it would be a great starting point for a fun patio design. Using the wall garden as inspiration, I went with a colour scheme that, for me, just screams summer. 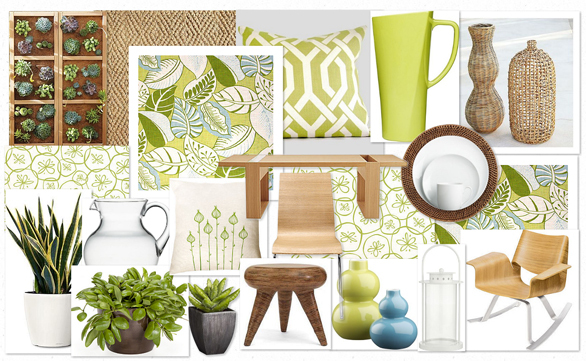 I love the natural wood tones against the crisp whites and lively pops of green. It’s a relatively simple design, brought to life with fun, lively patterns and great accessories. My favourites are definitely the snug martian dining table and the paper cloud petunias field place mats, which I think, looks like a bunch of cucumber slices. Anyone else? Either way, petunias or cucumber slices, they works for me.